Granito de Arena had its US premiere in Seattle, at the new independent neighborhood theater, Central Cinema. The two scheduled shows sold out, and a third late show had to be added to accomodate everyone who wanted to see the film! Post-screening discussions focused on the similarities between privatization policies in Mexico and in the US. Granito de Arena had its world premiere in Mexico City, on May 20th, in the Museum of the City of Mexico, then went to Oaxaca where over 30,000 teachers were out on strike. 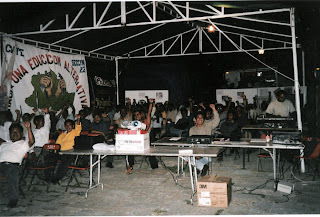 The teachers were camped in the streets of Oaxaca, and we held open-air screenings every night, projecting on the sides of buildings in different parts of the "planton," or encampment. Hundreds of teachers attended the screenings and participated in heated discussions about the issues raised in the film. During the week of screenings, the teachers launched a community radio project they have been developing for years. Radio Planton went on the air that week, and continues to this day, transmitting throughout the city of Oaxaca, featuring a wide range of programming that includes interviews with indigenous community leaders, children reading stories, youth activists talking about their struggles, and even a sexual diversity program every Tuesday. The union local (Seccion 22) distributed 1000 copies of Granito de Arena to school districts throughout the state.